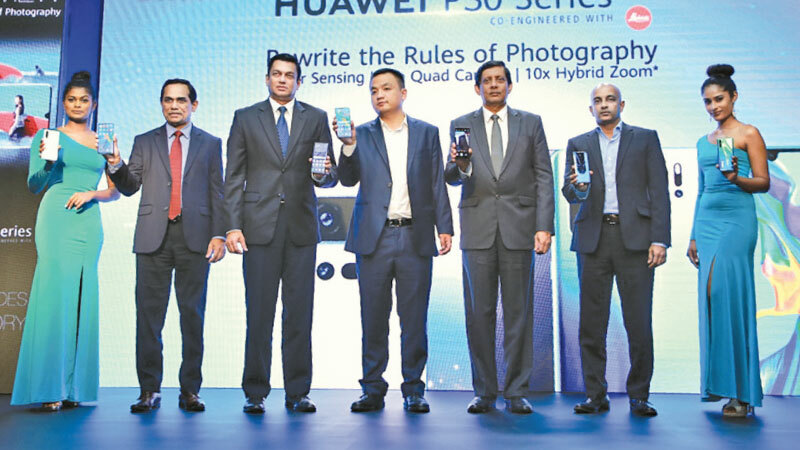 Huawei launched the Huawei P30 Pro at a gala launch event held at Shangri La. Changing users’ opinions on smartphone photography,the HUAWEI P30 Pro is equipped with world’s first Leica Quad Camera System, including a 40MP main camera with the HUAWEI’s world’s first SuperSpectrum Sensor, a 20MP ultra-wide angle camera, an 8MP telephoto camera, the HUAWEI ToF Camera and a 32MP front camera that takes selfies to a new level. Expressing his opinion on the launch of Huawei’s new device, Huawei Device - Sri Lanka Country Head Peter Liu stated “Huawei has consistently offered the best smartphone devices to our valued customer base through innovation. The Huawei P30 Pro, the latest addition to the Huawei P Series, comprises of many new features including the world’s first SuperSpectrum Sensor as well as a new HUAWEI Time of Flight (ToF) Camera and enhanced optical and AI image stabilization technology. With these revolutionary technologies, HUAWEI P30 Pro capture incredible photos and videos in every scenario. The 1/1.7-inch HUAWEI SuperSpectrum Sensor looks at light in a fundamentally new way, delivers extraordinary photography and videography experiences across a wide range of scenarios and lighting conditions—including extreme low light—producing images with enhanced detail, color and clarity. Through a new periscope design, theSuperZoom Lens supports high fidelity magnification of 5 times optical zoom, 10 times hybrid zoom and 50 times digital zoom. Unique to the HUAWEI P30 Pro is a HUAWEI ToF(Time of Flight) Camera that captures depth-of-field information to deliver accurate image segmentation. The SuperPortrait feature captures even the smallest details, such as individual strands of hair. AI HDR+ enables the front and rear cameras to combine multiple photos taken in quick succession to eliminate overexposed and backlit images. Supporting aspiring mobile videographers, the HUAWEI SuperSpectrum Sensor enables spectacular low-light video capture so night scenes appear bright and highly detailed. HUAWEI AIS and OIS support stabilization for all video capture settings, resulting in a perfect, steady shot. Additionally, the SuperZoom Lens allows for crisp close-ups, while the AI Video Editor enables users to add background music and special effects to their videos, turning the HUAWEI P30 Series into a mobile production studio. HUAWEI Dual-View Video, available in the P30 Pro allows the capture two perspectives of the same scene at the same time by using multiple cameras simultaneously. The HUAWEI P30 Series provides a full view of a scene while also capturing a close-up of a subject, unleashing new and exciting possibilities for video. The 6.47-inch HUAWEI P30 Pro and 6.1-inch HUAWEI P30 come in Breathing Crystal, Aurora Blue, and Black. The FHD+ (2340x1080) Dewdrop Display features a tiny notch, providing maximum display area. The near bezel-less front glass houses an In-Screen Fingerprint sensor for quick and secure identity authentication. The HUAWEI P30 Pro also features HUAWEI Acoustic Display Technology that enables it to deliver high-quality audio through a sound emitting display.